This blog is the final in a series produced for a Harvard Kennedy School field class on innovation in government. Our team is working with the MassIT Digital Services team and the Massachusetts Executive Office of Housing and Economic Development (EOHED). You can read about our project here and about our experience with learning about entrepreneurs in Massachusetts here. A recap of our synthesis exercise can be found here. Our experience in designing and prototyping a solution was described here. After spending several months interviewing entrepreneurs, like Carlos and Johanna, we came to appreciate the problems they face. We’ve shared our experience starting to design a solution that seeks to overcome these obstacles so Carlos can finally fulfill his dream of opening his own microbrewery, and Johanna can commercialize an app mapping incidents in high-crime cities. We built, tested, and refined our Crowdsourced FAQ Platform (which you can try here!) and believe our prototype is one that our clients can use as a starting point for Massachusetts’ entrepreneurs. By the end of this class we felt that we learned enough from entrepreneurs’ experiences that we could start our own businesses in Massachusetts. More importantly, we felt that the solution we have been building is based on meeting the needs of entrepreneurs. If implemented, we believe it will make the lives of our new entrepreneur friends easier. 1. Source content: getting high quality information can be the most challenging part of the final development phase, but also the most important! To get the best information, we propose starting by scraping popular websites (SBA, local Chambers of Commerce) for baseline information. To get the next level of information, we suggest EOHED host a write-a-thon to populate the advice sections from other entrepreneurs. 2. Verification: to make a crowd-sourced site work, we’d recommend a person to help moderate the content. We propose existing resources be reallocated to spend a few hours each week verifying posts from users before they hit the site. 3. Ownership: before investing heavily in further development, EOHED must determine who the right owner of this site will be going forward. While we feel this role likely should sit within EOHED, in a cross-departmental team, or with a community leader, this is an important piece to be finalized. 1. We believe that our friends who are trying to start their businesses in Massachusetts would greatly benefit from centralized information on the business processes and related issues, because today they often get lost in the many websites that are trying to help them, but do not provide all the necessary information. 2. We found that entrepreneurs depend so much on their networks to help them solve problems. We should make it easier for them to find people they need to connect to. 3. Since Massachusetts is divided into so many smaller townships with often different regulations, we should incentivize those townships to move towards the same standards of providing information for businesses so that it is easier for Carlos of Johanna to decide in which town they want to start their business. 4. And finally, we need to simplify personal support for entrepreneurs so that they can easily connect with the relevant government officials when needed to help them answer questions. 1. Your users will surprise you: getting out and talking to our users was a fascinating experience. Each entrepreneur’s perspective was colored by their unique experience—or lack thereof! Getting to know how users think helped us see things from their perspective and shaped where we focused our time and energy. Had we not engaged our users, our proposed solutions would have been very different and would be at greater risk of not being used. 2. User centered design is hard work, but it’s worth it: This process has been long. 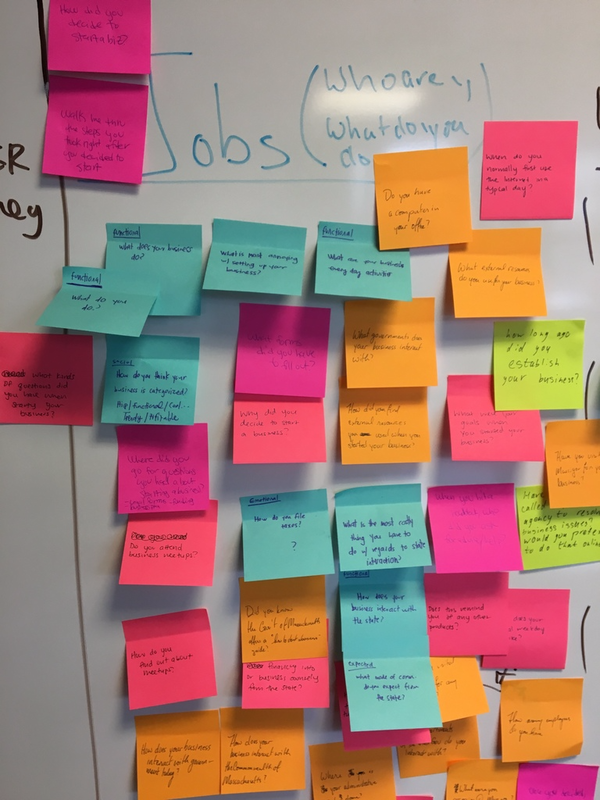 We’ve talked to a lot of people, generated, prioritized, and eliminated many ideas and used more Post-It notes than we have in the rest of our lives combined. But it allowed us to find solutions that will deliver the most value for the people of Massachusetts—solutions that we are sure will help our clients make lives of entrepreneurs easier. 3. This whole process is a lot of fun: getting to meet the people that you’re serving and seeing their excitement as they see the project progress has been rewarding. The process has lead us to be creative, flexible, and to laugh a lot. We can now see why so many of our class guests are such high-energy people! In closing, we took a lot away from this experience, and look forward to using these tools to serve wherever we find ourselves in the future. We hope our work supports change among our clients and has been a successful test case for a user-centric approach to government. We want to thank the entrepreneurs who devoted their time and efforts to work with us, help us think of solutions for them, and helped us test these solutions. We are also very grateful for the mentorship and support that our clients from MassIT and EOHED have provided. We look forward to following the Commonwealth’s ongoing efforts to support entrepreneurs and hope that our contribution will make life a little bit easier for Carlos and Johanna.